Weekly photo challenge: (wedding) relic – Go ask Alisa – DIY capsule wardrobe one stitch at a time! For WordPress weekly challenge, theme – RELIC. As per definition of Google, “relic” is an object surviving from an earlier time, especially one of historical or sentimental interest. This week I would love to present you something I did not think will make its way back to me. I received this object this morning. Still sleeping, I could hear a sound of door bell ringing and my husband opening the door. I could hear a familiar voice, but I quickly fell back to sleep, enjoying moments of my dreamland. I woke up couple of hours later and discovered a gift on our dining table. Still unopened, in the box, wrapped around with festive tissue paper. Finally, through the cloud of pink as cotton candy paper I saw a familiar item – my wedding bouquet. The person at the door earlier today – that was Bernadette. A good friend, a wonderful person and our witness at the wedding. She preserved the flowers, pressed and framed them, decorated the box and gifted back to us for many happy years and a long memory to come. 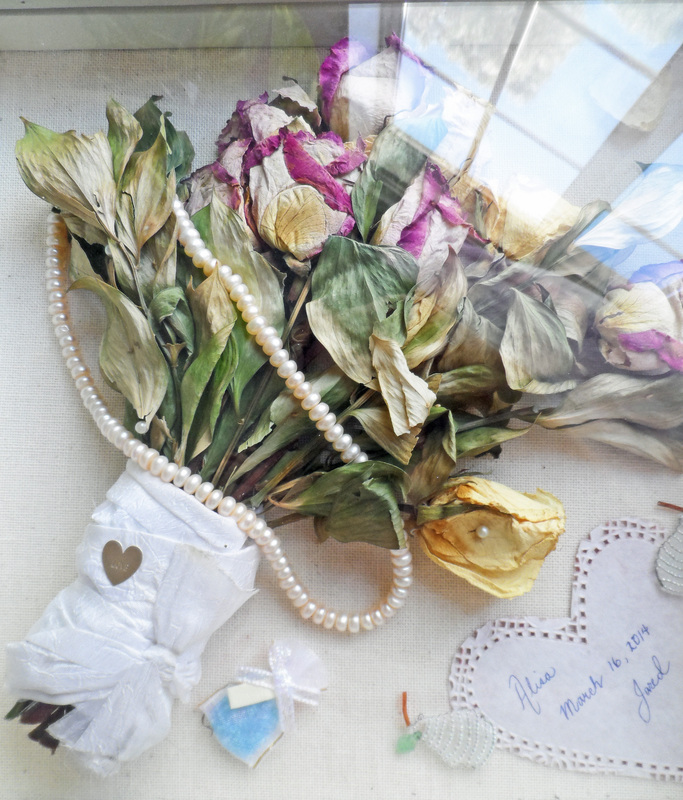 This bouquet is very dear to me: I handmade it the day before our wedding, it was a small ceremony without reception. Reception is yet to come on our first anniversary. Sentimental, an object of true value and memory, a significant, one of a kind event that happens once in a life time. This bouquet signifies it all: my love for my husband, dedication and many years to come. Thank You, Bernadette!